Horrorscreams Videovault - UK based horror site with news, reviews, interviews and more. 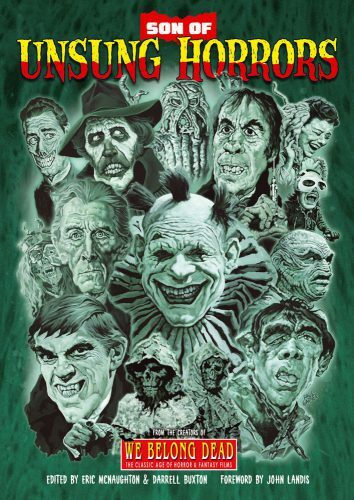 : Book Review: SON OF UNSUNG HORRORS written by various. Book Review: SON OF UNSUNG HORRORS written by various. No doubt many of you read the excellent We Belong Dead magazine and when its creator Eric McNaughton announced the release of the superb 70s Monster Memories, I among many hoped that it wouldn't be a one and done deal. Following the monster memories book came Unsung Horrors another fantastic insight in to movies of yesteryear and of course the highly collectible book Celebration Of Peter Cushing who I am sure needs no introduction, but if you ever needed a book covering Peter Cushing thats the one to get....if you can find one that is. Now creeping out of the shadows and ready to terrify the bookshelves of many horror fans comes Son Of Unsung Horrors. Much like its older, scarier father Unsung Horrors, this next volume (Son Of Unsung Horrors) takes us on a wild trip from the silent era into the seventies, all across the world and back around again just in case one of those films got missed the first time around. Just missing out on hitting 200 titles in this volume, you are going to come across at least one title you haven't heard of or seen so expect to be going on a movie hunt after you have read this book. What could classify as an 'Unsung Horror' is anyone's guess as while one film is a classic to one person, to another it may resemble that awkward moment at the dinner table with the mother-in-law where your hands touch and forever scars your mind in the worse way possible. To put it quite simply its a movie that is crying out for attention and here it gets its due credit, even if you you may not like the film yourself. Beautifully laid out throughout in colour with lobby cards, posters and general imagery from each film title, its sad to see that the art of promoting a film nowadays has come down to how long an actor can sit on the Jonathan Ross show and promote their latest work. Bring back the excellent posters, the lobby cards and the downright ridiculous (but they worked) gimmicks that William Castle was well known for. While some may find it annoying that the titles are not alphabetical but randomly thrown in here and there, I personally found this a good idea as you can come across a title that you wouldn't normally read about it and soon become intrigued and wondering why you have never watched THE EMBALMER for example. Now what really makes this book special is that the titles written about are from various writers ranging from authors, bloggers and those who are making their first ventures into writing, and what a great credit to have to your name by saying you were published in Son Of Unsung Horrors. Highly recommend picking this book up if you can get your hands on it, but be quick because if its like previous releases by the We Belong Dead group, this will be a fast seller and quickly out of print! ORDER YOUR COPY OF 'SON OF UNSUNG HORRORS' BELOW.